Just recently we jumped in the car and drove to the bottom of the country and just over the Belgian border, to style and shoot a charming old country house. The moment we stepped inside we fell for the striking patterned floor tiles (original to the house and discovered by accident) and the rest was history. 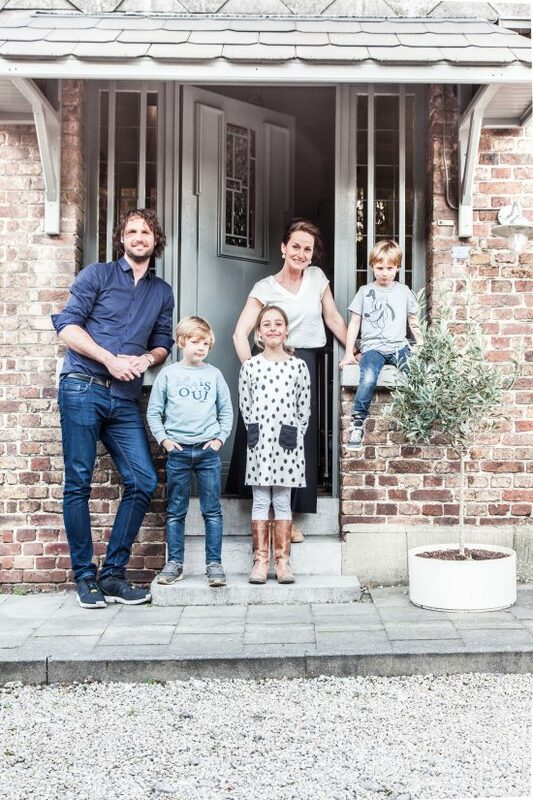 Aside from being completely charming herself, the home of Liza van der Stouwe of Atelier Rozijntjes, her husband Vincent and their three children is far too charming not to share, and having recently featured in vtwonen magazine, we felt it was high time we brought you a long overdue ‘Inside Scoop’. 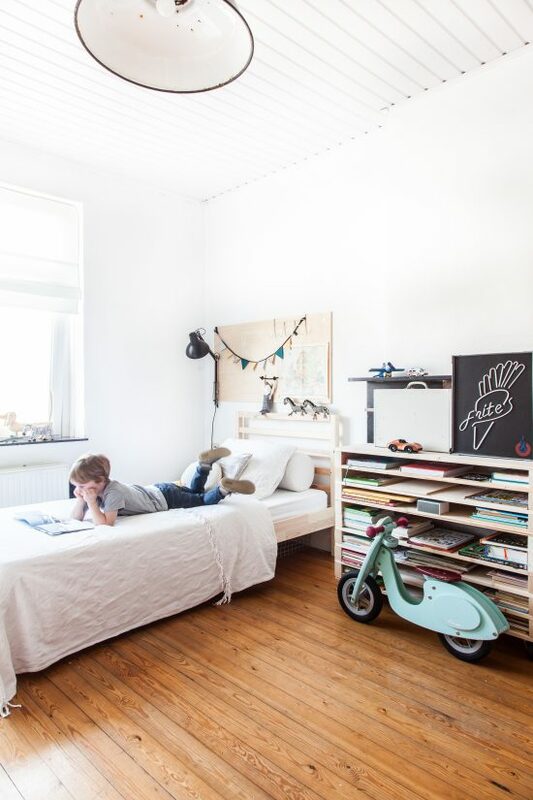 We hope you enjoy this full home tour of a family abode bursting with Belgian country charm every bit as much as we enjoyed documenting it. Let’s jump straight in, shall we? 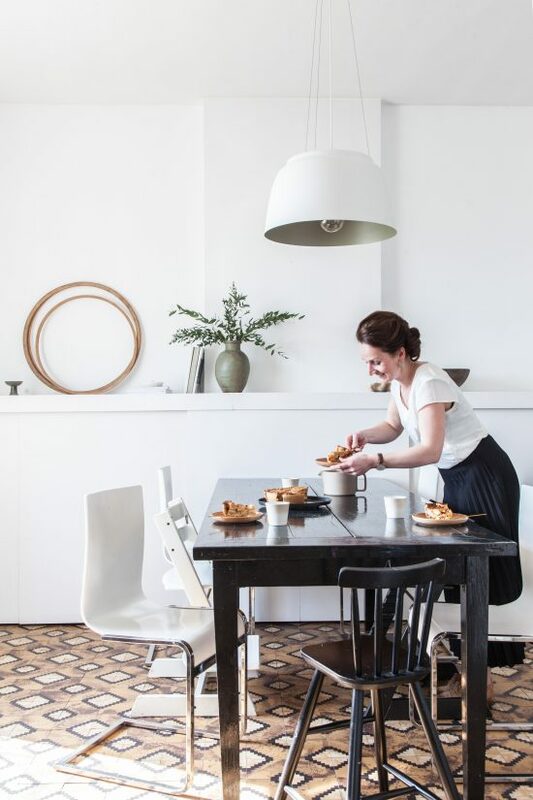 Living a country life in Belgium wasn’t exactly the dream for high school sweethearts Liza and Vincent, who took over the rental of their 182m2 house a decade ago, falling for it’s charm, spaciousness and sweeping views the moment they stepped inside. 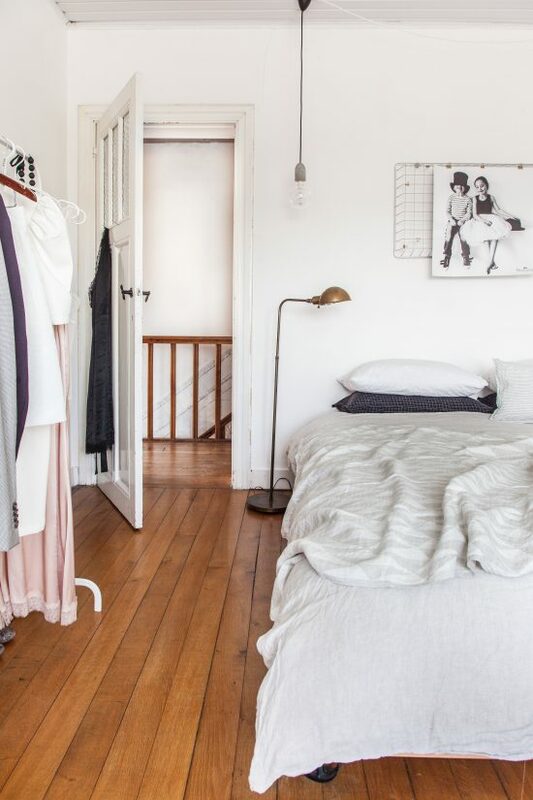 The elderly landlords granted liberty to update the dated interior to their heart’s content with one condition – that the wooden staircase and upstairs floorboards remain intact. 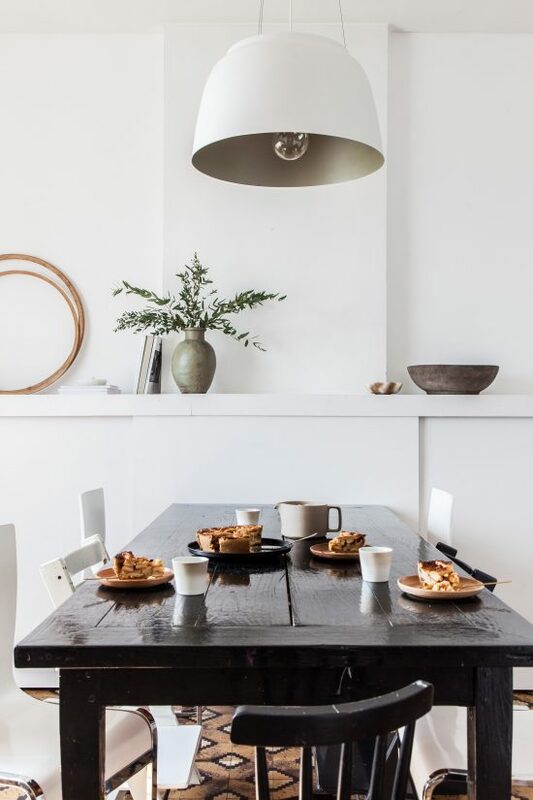 The dining table belonged to the house when they moved in, which Liza brought in from outside and painted black, pairing it with modern design chairs found on a shopping trip in Liege. 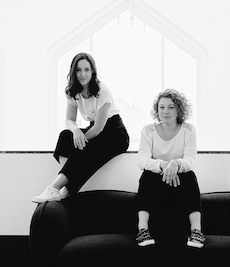 The wooden hoops were rescued from an old school building in Maastricht where Liza and Lynn’s atelier is situated. 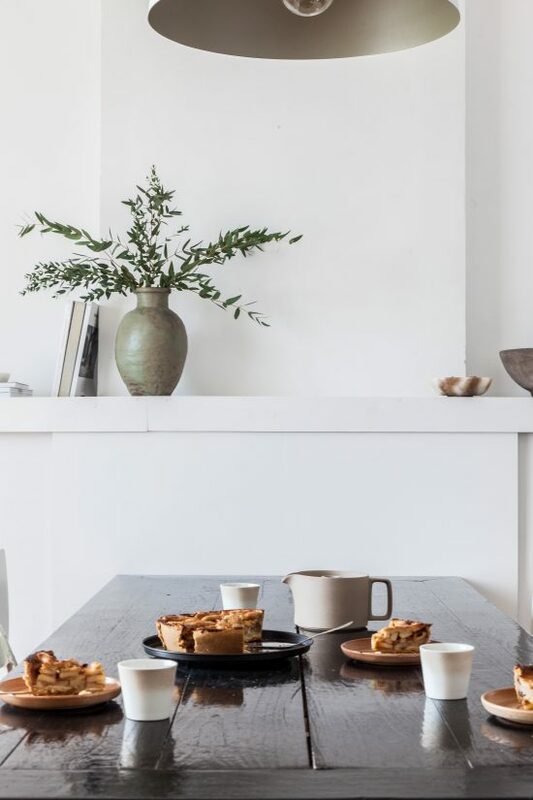 The teapot is by Japanese label Hasami and the porcelain mugs are a Kirstie van Noort design – both from a shop in Rotterdam called Pantoufle. The couple use the old woodburner throughout the winter, to stave off the chills that are typical for an old house. ‘An old house has its pros and cons,’ explains Liza. 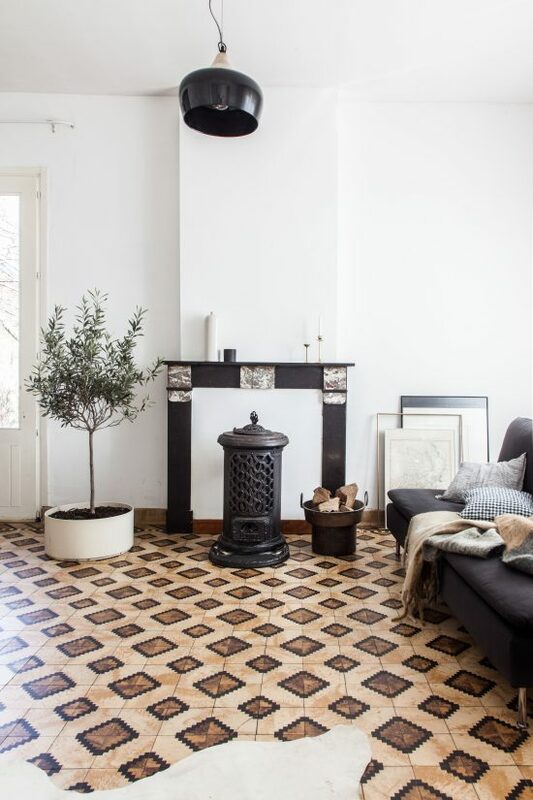 ‘It gets particularly cold upstairs in the winter, and downstairs too with the tiled floor, but a crackling fireplace is such a charming element in the space and instantly makes the room feel cosy and warm.’ When spring arrives, the couple enjoy an almost instant sense of being on holiday in their own home, and outdoor life begins. 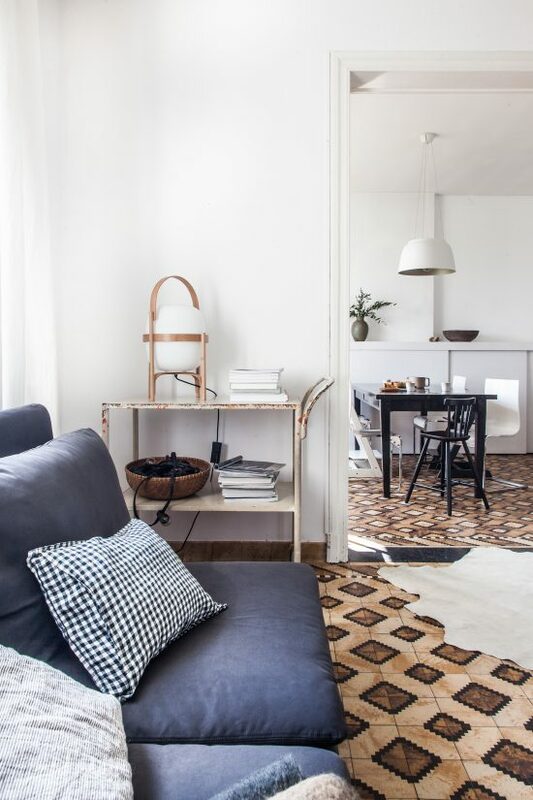 Their minimally styled living room features a functional Ikea sofa, checked and striped linen pillows from Pantoufle that add a dash of pattern, while a cozy throw (from Hinck Amsterdam) in autumn hues compliments the tones in the floor tiles perfectly. 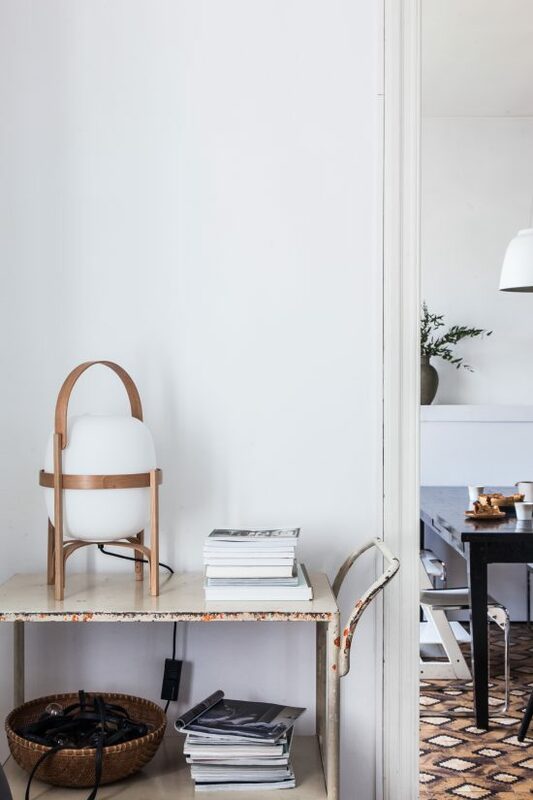 The contemporary lamp featured on a vintage trolley is a design by Miguel Milá for Santa & Cole. 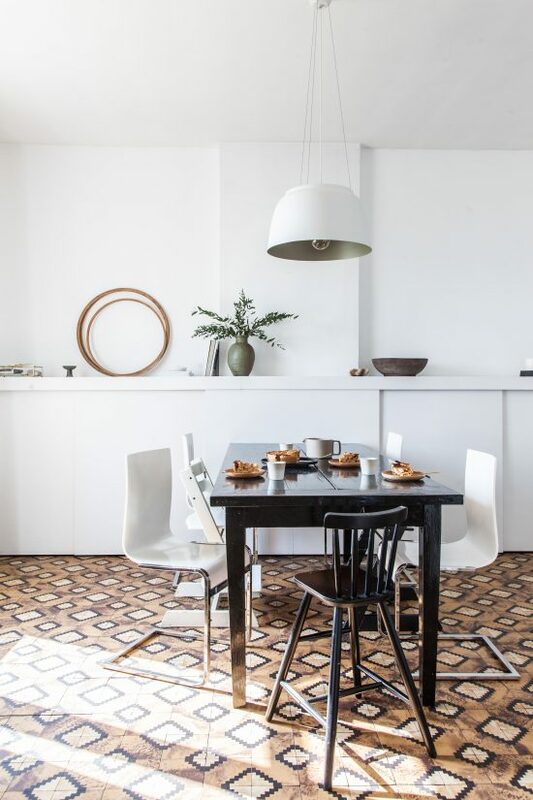 It was Liza who discovered the original patterned tiling downstairs, initially with the intention to replace a set of ensuite doors that were removed years ago when a new laminate floor was placed. 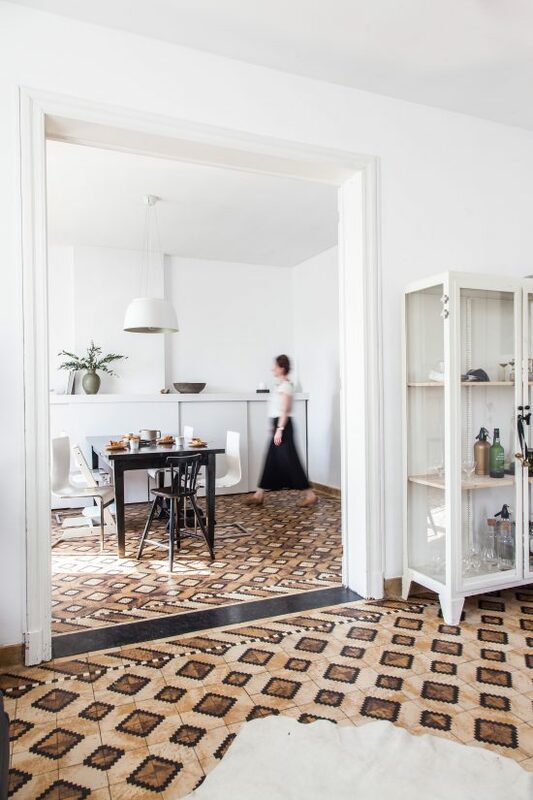 When the floor seemed too high to accommodate the doors, she decided on a whim to remove the laminate so the door would fit and underneath lay a charming tiled floor, typical for the region in which they live. 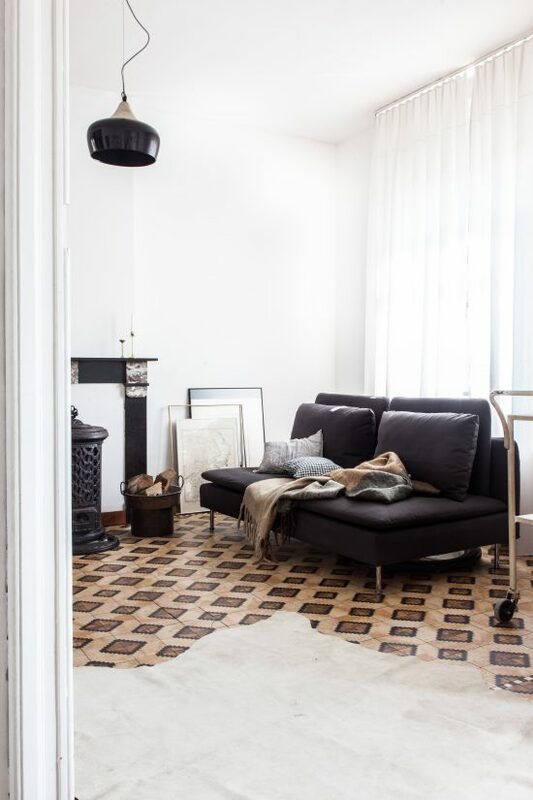 ‘When I saw those tiles my heart did a little leap of excitement. I had wanted to change the laminate floor for years, and then that happens!’ she recalls. 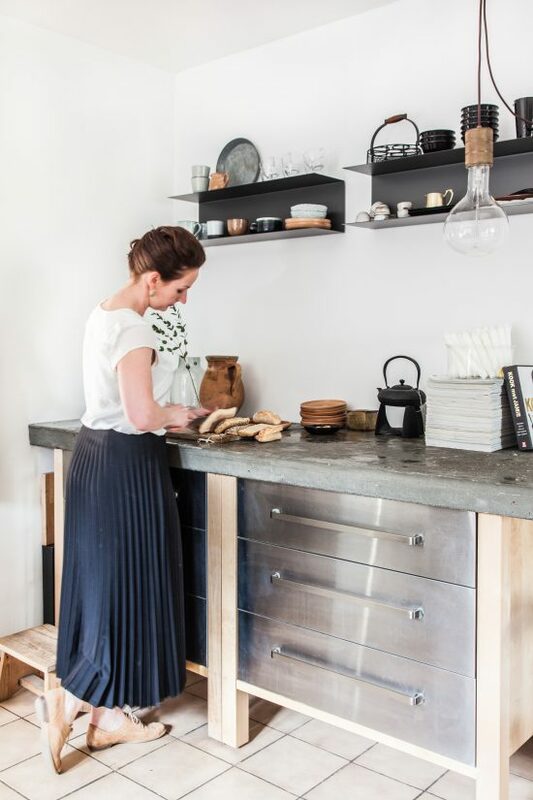 One of her most challenging home projects to date is the creation of their concrete kitchen worktop. 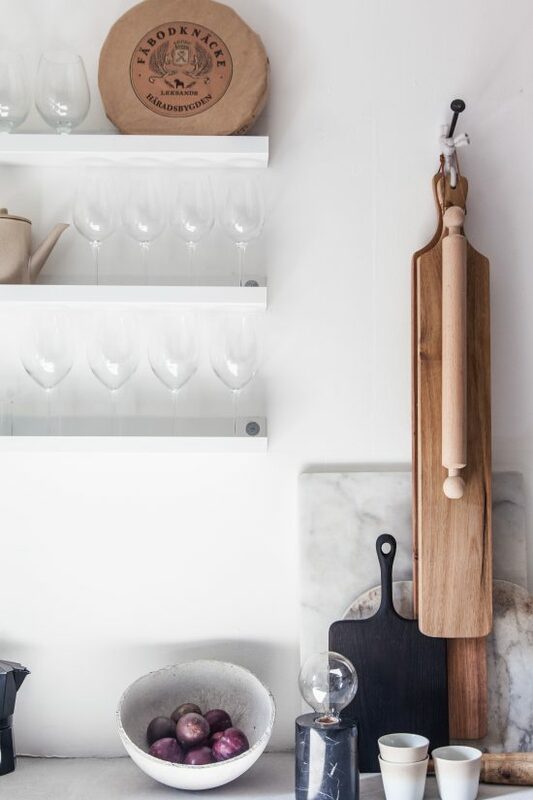 Given that they are renting, she and her husband decided not want to invest in a new kitchen but did want to give the existing kitchen their own personal touch. While the kids were at school one day, Liza decided to create a custom concrete worktop, from scratch, all by herself. 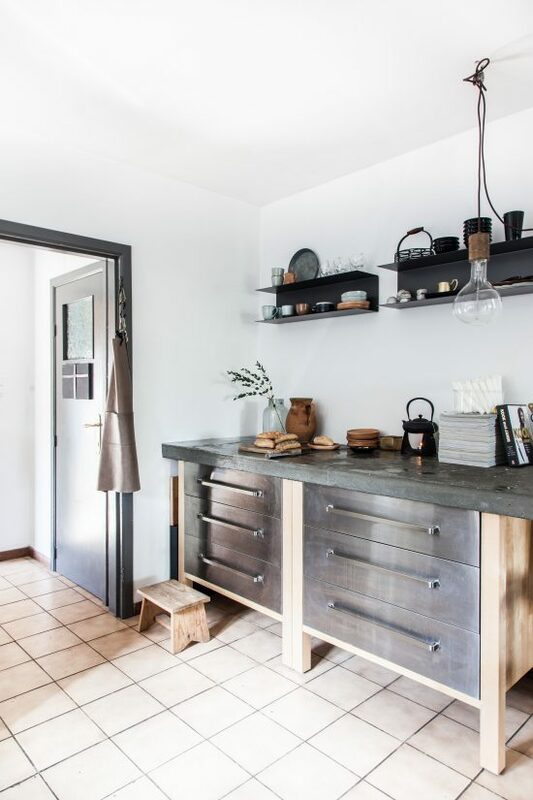 She purchased a loose counter top from Ikea, replacing the wooden sheet with concrete and finishing it with an epoxy layer. ‘That was kind of a spontaneous decision,’ she explains. ‘I started in the early afternoon, knowing I had to pick my kids up from school at three forty-five. Not ideal. You can’t just put concrete away for a bit and just think “nah, I’ll finish this later”. But I had already started so it simply had to be done on time. It was a huge mess in the kitchen, complete chaos, but it worked out and exactly at a quarter to four I was at the school yard to collect my kids. I discovered a tear in the concrete later on, which I was not pleased about at first but now I feel it adds to charm of something handmade. The kitchen is now, with a little bit of love and a lot of hard work, exactly how I wanted it,’ Liza says. Liza and Vincent’s bedroom offers sweeping views over neighbouring fruit orchards and fields beyond. 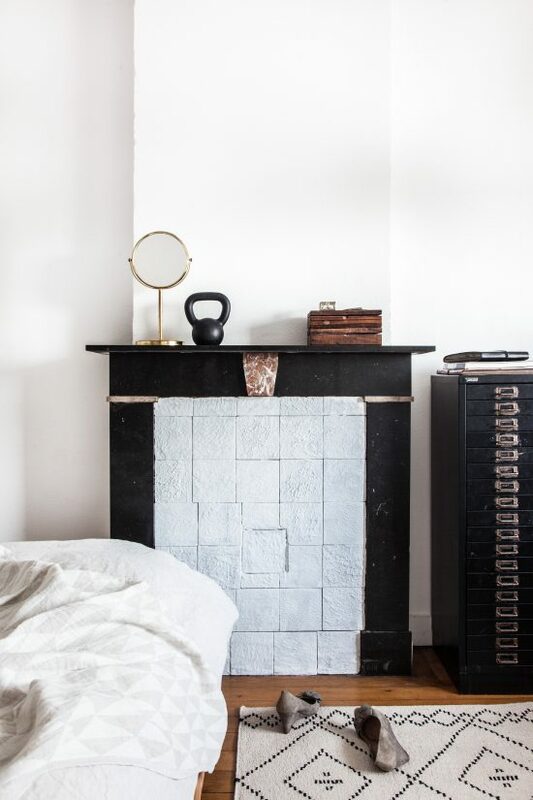 Amongst vintage finds, the space features bed sheets from Zara Home, black check pillows by Linge Particulier and a block print linen throw from Rafa Kids. The brass floor lamp was a Habitat purchase. 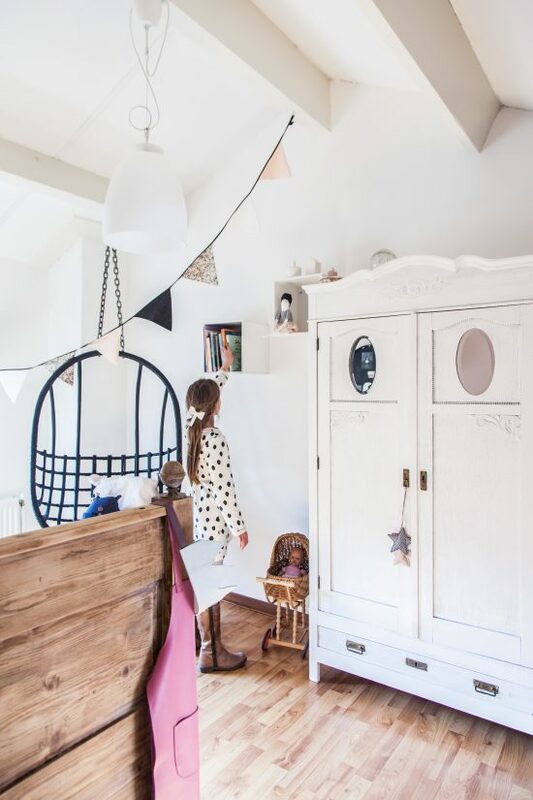 The couple’s oldest child, Anaïs, enjoys a feminine space featuring soft pink walls, vintage furniture and creative details, many of which are made by Liza. 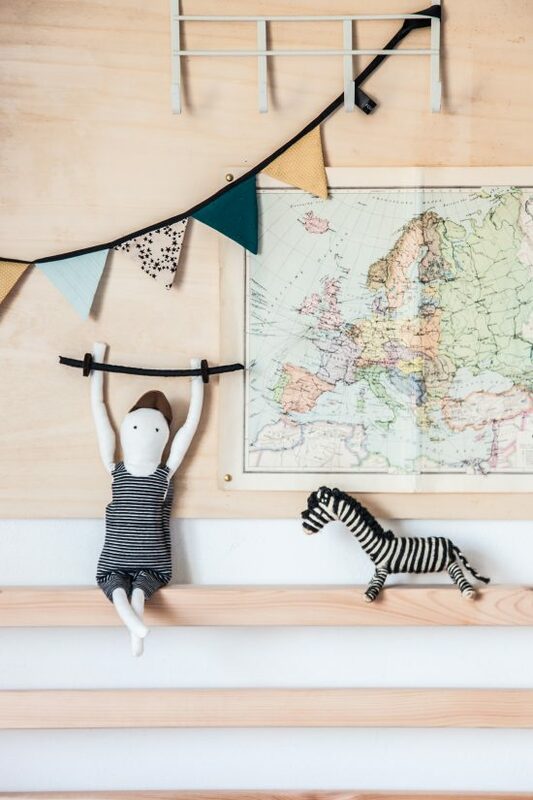 On the bed, her dolls are in good company with dusty pink bed linens from Rafa Kids, and linen pillows from By Mölle, and across the room is a hanging chair from Sissy Boy for reading. Brothers Florèn and Olivier share a bedroom. 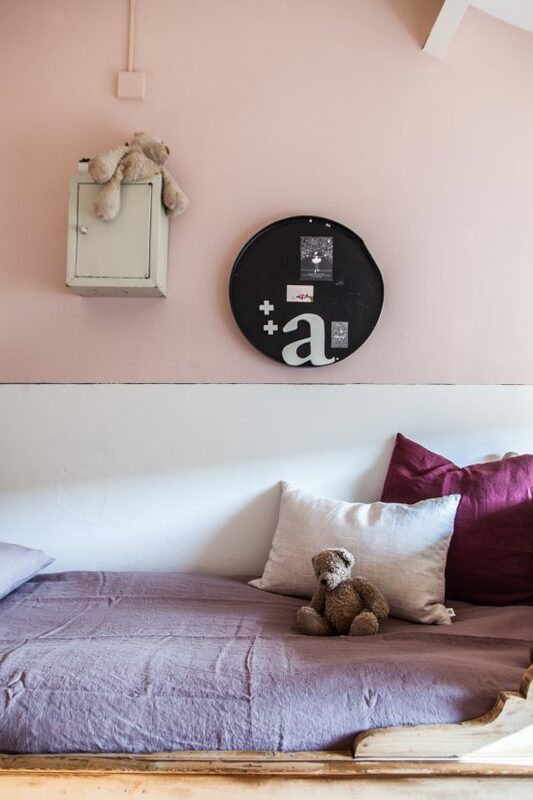 ‘It’s definitely fun, but it was a practical decision to have them share since we didn’t have an extra bedroom,’ Liza says. 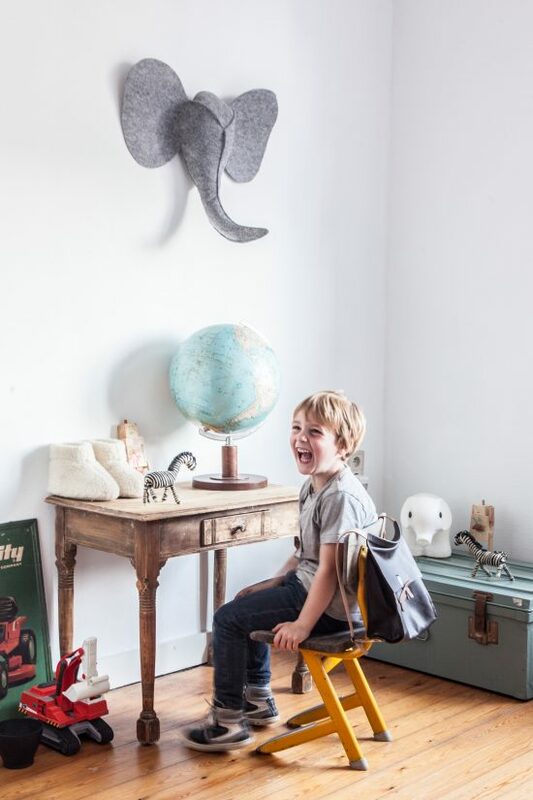 While Liza made many of the accessories in the space, including the fabric bodybuilder ‘Koos’ above the bed, leather bags and felt elephant, the bedroom is a mix of old and new pieces and meaningful objects that create a playful but personal space for the boys. Not to be forgotten, the bathroom also received Liza’s creative touch, with nothing but a few well-chosen accessories and a bit of imagination. 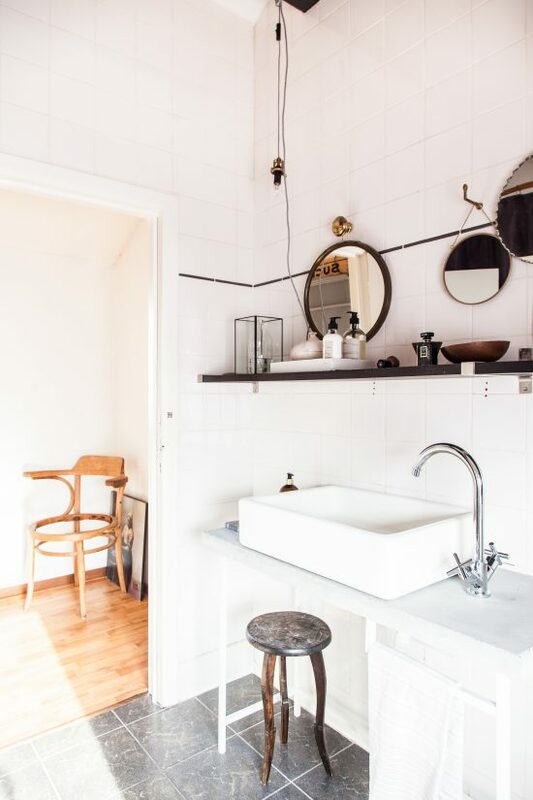 ‘I appreciate clean, modern bathrooms as much as anyone else, but I get a buzz out of rethinking a space and the existing elements,’ explains Liza. 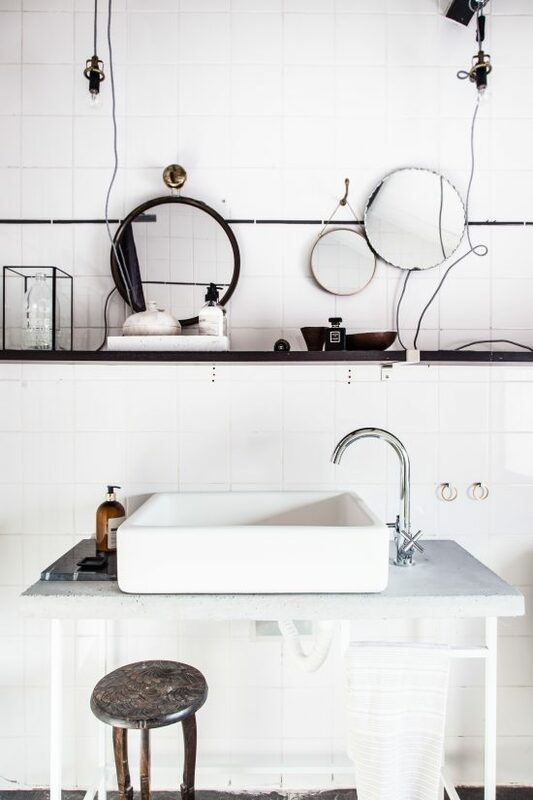 She transformed an Ikea vanity by creating a striking concrete counter top, and hung a collection of antique mirrors she found at a flea market in Leige. Liza doesn’t strive for perfection at home. 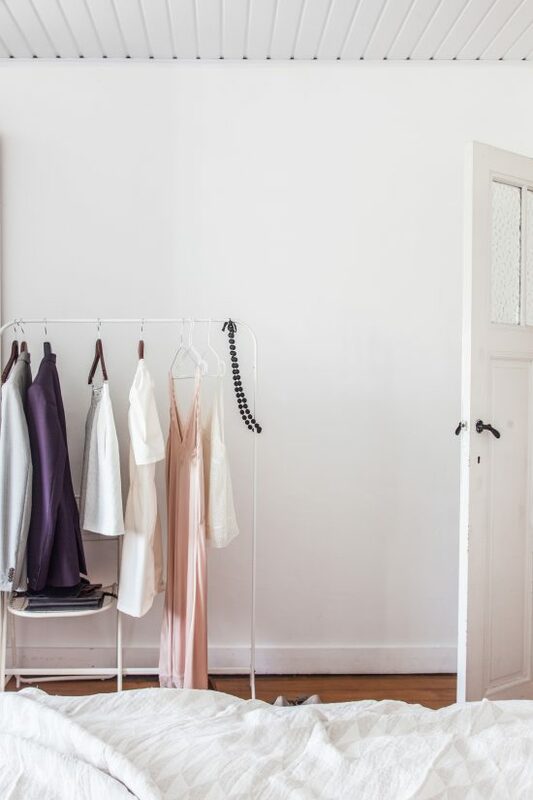 ‘The combination of imperfection and simplicity is what speaks to me,’ she says. ‘I love a white base and have an appreciation for Scandinavian interiors, but sometimes they can be a bit sterile. 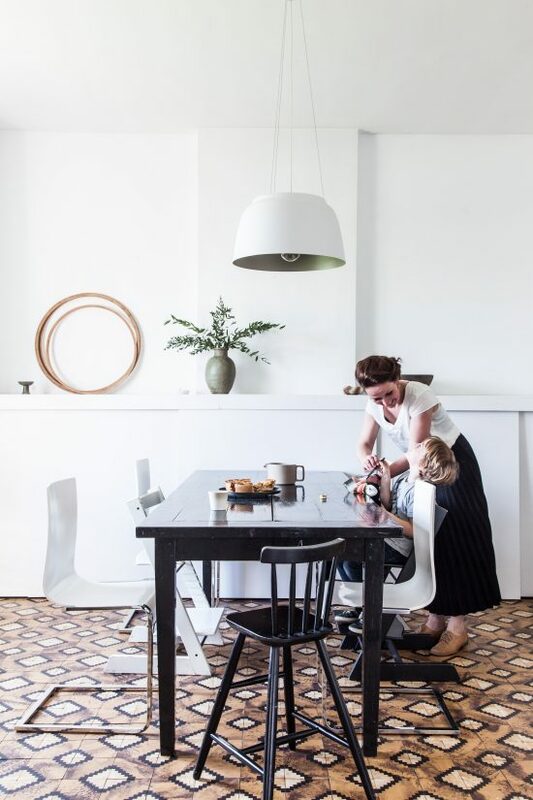 I add a little southern nonchalance to give our home a relaxed vibe.’ And all while making small but careful changes to the house with respect for their landlord, Liza has in fact done everything she would have done had they owned the house. Thank you so much Liza and Vincent for letting us document your home! 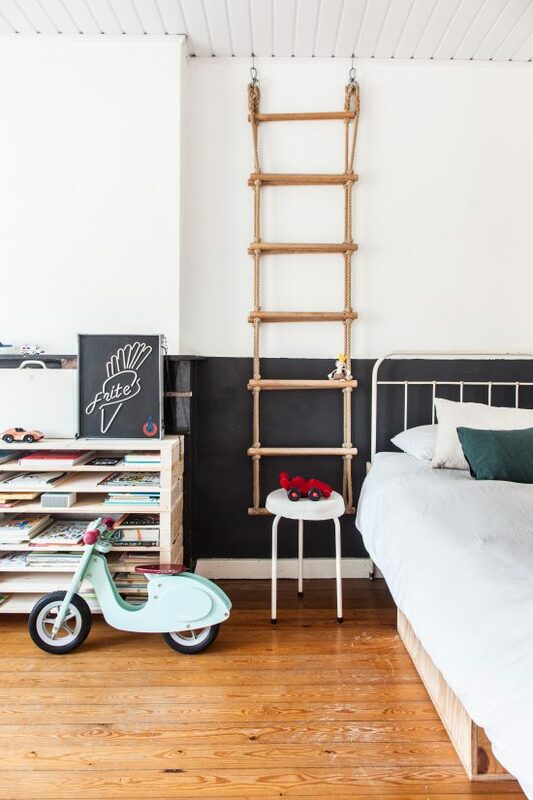 We loved finding out about your decorating journey, are in awe of your creativity and ability to rethink your rental home and your courage to try new things regardless of the outcome and without a need for perfection. How refreshing! And special thanks to Lotte Herink, our partner in crime who so beautifully wrote Liza and Vincent’s home story in Dutch for vtwonen. We had such fun together with you on this shoot, Lotte! Hope you enjoyed this home tour, happy reading folks and we’ll be back to share some of our own interior styling work soon. It’s been a busy month of completing projects and we can’t wait to show you the results of months and months of hard work behind the scenes! Wow Holly I love this house, that floor is simply amazing. Great job, the photo’s are amazing! Beautiful! Do you know where she purchased the black shelving in the kitchen? It’s such a nice stage for lovely everyday items. It looks like the shelves that VIPP has in their kitchen collection. Although IKEA has something similar (in white only). 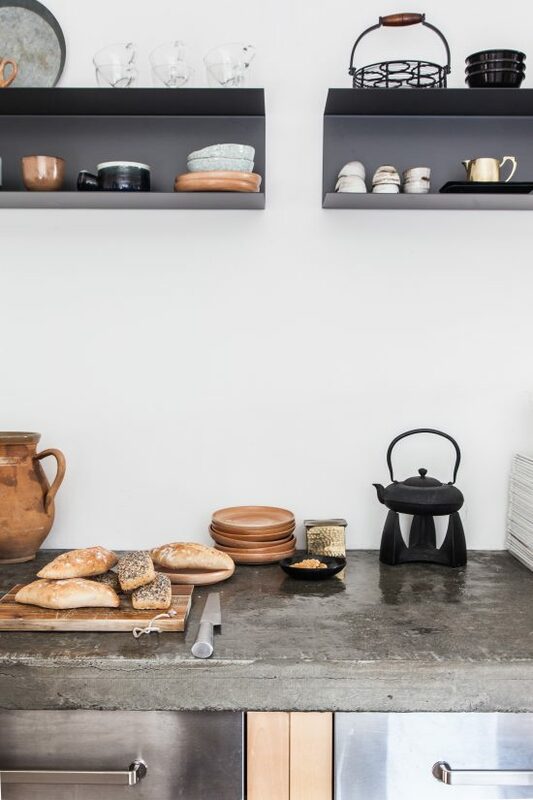 Please can you tell me where the chic black shelves in the kitchen are from? The house is lovely. Hi, this house is so similar to our home style.. i love it, i was wondering if the concrete counter was finished with someting else than epoxi? because we are doing our countertops but dont know how to proof it? any advise? thanks from Argentina!